Los Angeles MC Open Mike Eagle makes good on all three words in the title of his debut full-length, Unapologetic Art Rap. He's unapologetic for being different and unrepentant in its his pop-culture criticisms. He is surely artistic, drawing on influences from Pavement to De La Soul to TV On The Radio and reshaping them in his own image. Which leads finally to rap. On his first album, Open Mike Eagle sounds like a seasoned veteran, filling every bar with brilliant wordplay and effortless West Coast flow. 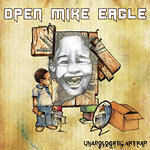 He is aided by guests Busdriver, Nocando, Serengeti, Alpha MC, and his crew the Swim Team, and has a team of producers the includes Alwayz Prolific, Maestroe, and L.A. heavy-weight Exile, but the album is clearly an Open Mike Eagle showcase. Unapologetic Art Rap may very well be looked back on as the album that kicked the door open on an impressive career.